Stealing Snow kicks of at a mental hospital in upstate New York but we soon come to realise that this is not an 'issues' story, it is a fantasy one. 17-year-old Snow may seem like the most normal person in the place with other residents thinking they can time travel or fly, and Bale, the boy she has always loved who burned down his childhood home, but strange things happen to her too. Ever since she tried walking through a mirror as a child and pulled a friend along with her she's been stuck in the mental hospital, the scars covering her arms being a constant reminder that something isn't quite right. While I wasn't a huge fan of Dorothy Must Die, I wanted to try Danielle Paige's work one more time as I do love fairy tale retellings and the summary made Stealing Snow sound right up my alley. Unfortunately, while the premise was very intriguing indeed and I thought the asylum angle was highly original, the execution really let this book down. 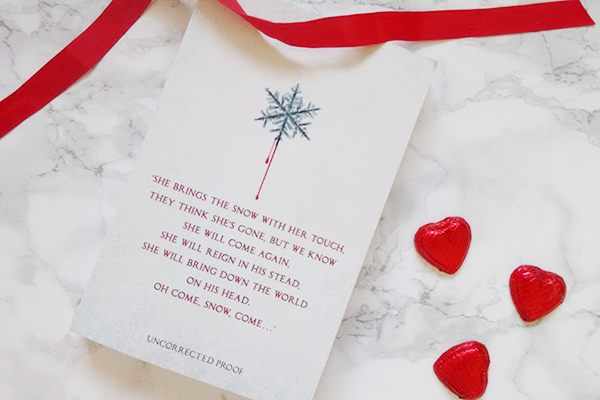 Rather than focusing on Snow's journey from confused teenager in our world to powerful ice queen in an innovative new realm, the majority of the story was taken up by Snow falling in love with one guy after another. There are only three teenage boys in the book and each and every one is presented like a suitable match, which is just a tad too insta-love for my liking. I don't mind a romance storyline at all, but the convenience of this love square really made it seem like the fairy tale angle was just a front to cash in on a current YA hype while producing a very generic teen romance. That isn't to say that there weren't some really interesting aspects to the story, because there were. From the snow beasts to the witches and the Duchess to the Robbers, the more fantastical elements within this book were original and fascinating. There is so much potential within the pages of Stealing Snow, and there are flashes of greatness, but overall the storytelling is just too clunky. The final chapters, which turn the plot upside down, were also terribly predictable. However, the last page was very well crafted indeed and might just tempt me to check out the sequel. Stealing Snow will be published by Bloomsbury on 6 October 2016 and you can pre-order the novel from Foyles or your own preferred retailer.